Dual Spine Weight Forward™ - Proprietary fusion of different carbon materials that creates 2 spines in 1 arrow to manage energy better and make arrows recover faster, spin 20% sooner, retain more speed and deliver unparalleled broadhead accuracy. BuffTuff™ - Front shaft section made with BuffTuff, the worldí´s toughest and quietest carbon arrow finish. Real Straightness™ - Every Mayhem DS arrow is laser checked for straightness to a remarkable 1/10,000 of an inch. Mayhem DS straightness of +/- 0.0035" is a maximum measurement, not an average. ONE ARROW. TWO SPINES. Twice the ACCURACY. 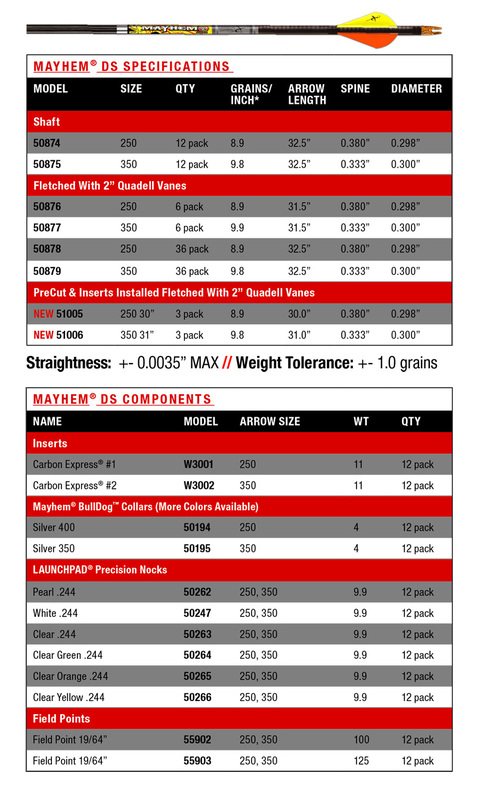 The Mayhem̴™ DS re-defines and elevates hunting arrow performance in the mid-tier price class. The Mayhem DS is engineered with our proprietary Dual Spine Weight Forward̴™ technology to deliver more speed, accuracy and penetration. It features our arrow construction with patented BuffTuff̴™ for extreme durability and quiet draw. These arrows are ideal for practice or bowhunting just about any game. These arrows shot better than expected because they measured an average of much better quality than advertised. Out of 12 arrows they all group inside 3 inches at 60 from a 320 fps performance bow. 100 grain screw in points are the perfect forward balance amount for better speed and wind stability. I expect these to also work great on the 3D course.